The Center for the Advancement of Science in Space's (CASIS) ARK1 mission patch as designed by street artist Shepard Fairey. A celebrated street artist has turned his attention spaceward, designing a mission patch for the first set of sponsored experiments to be sent to the U.S. National Laboratory on the International Space Station. Graphic illustrator Shepard Fairey, perhaps best known for his stylized "HOPE" poster of Barack Obama from the 2008 presidential campaign, but also recognized for his work through the movement OBEY, was recruited by the Center for the Advancement of Science in Space (CASIS) to create an emblem to represent ARK1, the organization's first set of investigations flying under the increment name Advancing Research Knowledge 1. "The idea of doing something that is actually going to go into space and be part of exploring new technology that is unknown, I think that even just tangentially, is an amazing thing to be connected to," Fairey said in a video statement released by CASIS and the design agency Fiction. "I was really excited to be invited to be part of this project." ARK1, which is set to launch this fall on board a SpaceX Dragon cargo spacecraft flying the third NASA-contracted commercial resupply mission to the station, is planned to include protein crystallization research and binary colloidal alloy tests, as well as the education program, "Story Time From Space." Artist Shepard Fairey showing an earlier concept for the mission patch he designed for the CASIS ARK1 science payloads. The CASIS payload aboard the Dragon capsule will also include a number of Fairey's ARK1 mission patches. "I'm amazingly spoiled in the range of awesome projects that I have gotten to do, but this is something I've never been able to do and I think it is maybe a once-in-a-lifetime opportunity," said the graphic designer and illustrator. Fairey's ARK1 triangular-shaped insignia borrows its blue and green colors from the CASIS logo, which itself is part of the design. Above the geodesic dome and central to the emblem is a depiction of the International Space Station. "I wanted to convey the most appealing aspects of the station and then also maybe get a sense of motion," said Fairey. "But with a patch being so small, you really need to simplify the elements to make them work in an iconic way." On the patch, the station is shown in a configuration that includes components that are either no longer in flight — the space shuttle — or, like the Russian science power platform extending from the "top" of the orbiting outpost, were canceled before leaving the ground. Both elements continue to be common in a number of other depictions of the space station, including those still in use by NASA. "Reducing and abstracting the space station to something that worked with really simple forms but was still really pleasing was a big part of the objective," Fairey said. Above the space station on the patch are two overlapping circles with the numbers 37 and 38. The ARK1 research will be conducted on the International Space Station by Expedition 37 and Expedition 38 crew members, including NASA astronauts Karen Nyberg and Michael Hopkins. "The unveiling of this patch signifies a historic moment in the aerospace community, where a third-party entity is moving forward to send payloads to the ISS that will benefit all humankind," said Jim Royston, CASIS interim executive director. 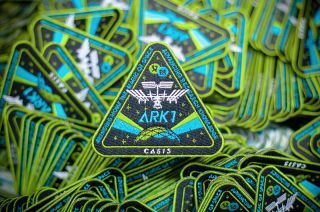 "Having a gifted and celebrated artist like Shepard Fairey designing this significant patch allows CASIS to reach new audiences that will enhance our mission of promoting the National Lab." CASIS revealed the patch at the recent Engadget Expand Conference in San Francisco, where they also promoted a partnership with the MassChallenge startup competition and accelerator program to find and award new projects to be launched to the International Space Station. Conference attendees had the opportunity to pick up one of the patches, as well as possibly win a patch signed by Fairey. According to Fiction, Engadget plans to also give away artist-autographed patches through its website. "I'm flattered and honored that I could create something that becomes just a small symbol of how things can move forward, the excitement of the unknown," Fairey said. "To be part of that is really a cool thing." Click through to collectSPACE.com for a video of Shepard Fairey describing his mission patch for CASIS’s ARK1 science payload being flown to the International Space Station.